Sir Jackie Stewart’s story is remarkable. It encompasses his battles with dyslexia, how he became a world-class clay-pigeon shot, his early struggles to fulfil his passion for motor racing and how he rose to become one of the greatest F1 drivers of all time, before excelling at a new career in broadcasting, business and as a F1 team owner. From growing up in a Scottish village, to the racetrack of Monaco and the boardrooms of the world, Sir Jackie’s story is an inspirational tale of drive and determination, bristling with drama, excitement, glamour, the tragedy of lost friends, controversy, celebrity, danger and stunning business success. Jackie was involved with cars from an early age. His father’s garage sold Jaguars and his elder brother Jimmy was a talented driver who was a member of the Jaguar works team in 1955. Jimmy retired from racing after an accident that year because he knew that his mother was unhappy with him racing. Soon after, Jackie, whose dyslexia was undiagnosed till much later, left school, by his own admission, “with great relief”. He found his personal voice in sport: first as an Olympic-class shot, then in motor racing, where to avoid worrying his mother, he first competed as ‘A.N. Other’. Jackie Stewart competed against some of the great names of Grand Prix legend: fellow-Scot Jim Clark, to whom he was so close, Gurney, Surtees, Hill, Rindt, Fittipaldi and their peers. In doing so, he crafted a reputation and a racing record that would stand for 14 years, an eternity in Formula 1 terms, until broken by another great driver he much admired, France’s Alain Prost. Jackie’s Formula 1 achievements still place him among the top five drivers of all time. Seen by many as the first truly modern professional racing driver, Jackie has done more than any man before or since to build a business life on the basis of his on-track record. Translating his legendary eye for detail from cockpit to boardroom, he has shared with the automotive industry, especially in his long partnership with Ford, the rich fruits of his racing experience. Thanks to his hands-on participation in the work of Ford’s development engineers, a generation of road-going vehicles is better for his contribution. The drive he brought to his often solitary campaign for circuit safety is matched by the energy he expended as Chairman and Chief Executive Officer of Jaguar Racing – a position he retired from in January 2000. The uncanny eye for an opening that served him so well on the track is now his greatest asset in his business life. Identifying potential partners, and making partnerships work for all the players involved, has been invaluable in his guiding role with Stewart Racing (formerly Paul Stewart Racing) since 1988 and with Stewart Grand Prix, which grew from that association in 1996. Willingness to look beyond the confines of traditional racing relationships is also the hallmark of Jackie’s contribution to all these enterprises. 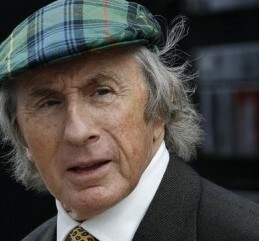 Jackie Stewart has been recognized as a sportsman, by the award of the OBE and a knighthood, and as an inspirational speaker and motivator by honorary doctorates from as far afield as Michigan, Glasgow Caledonian University and, most recently, the Heriot-Watt University in Edinburgh.